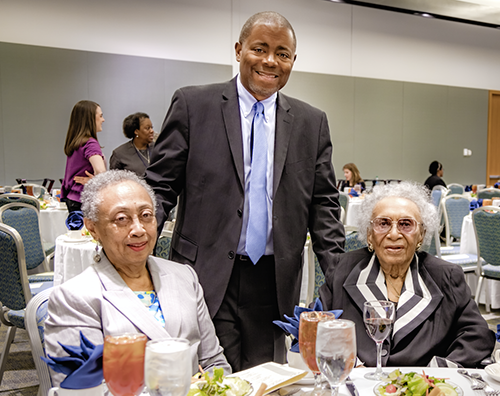 On October 26, 2016, Frankie Muse Freeman, who will turn 100 years old in November, attended the Virginia State Bar Pro Bono Conference and Celebration in Hampton to receive the first of an on-going award named in her honor. The annual Frankie Muse Freeman Organizational Pro Bono Award will recognize Virginia organizations that provide exemplary pro bono legal services to underserved Virginians. Caption: Frankie Muse Freeman at the Pro Bono Cenference and Celebration with her daughter, Shelbe Freeman Bullock, and VSB Access to Legal Services Director Karl Doss. Freeman was born in Danville, on November 24, 1916. She graduated from Hampton University and then received her law degree from Howard University. Freeman served as co-counsel on the NAACP’s successful racial discrimination suit against the St. Louis Board of Education in 1949. She was lead attorney on the NAACP’s landmark housing lawsuit, Davis et al vs. St. Louis Housing Authority, which ended legalized racial discrimination in public housing in 1952. In 1954, Freeman won the appeal of that case before the US Supreme Court. Freeman was appointed to the US Commission on Civil Rights by President Lyndon B. Johnson, and then reappointed by Presidents Richard Nixon, Gerald Ford, and Jimmy Carter. She has received numerous civil rights accolades including: induction into the International Civil Rights Walk of Fame at the Martin Luther King, Jr. National Historic Site in Atlanta; the NAACP’s highest honor, the Spingarn Medal; the Spirit of Excellence Award from the American Bar Association; and in 2015 President Barack Obama appointed Freeman to the Commission on Presidential Scholars.